Time for one more giving quilt! We’re going for some controlled improv this time around, using the Berry Icy Ice Bar block from Jodie of Persimmon + Pear. 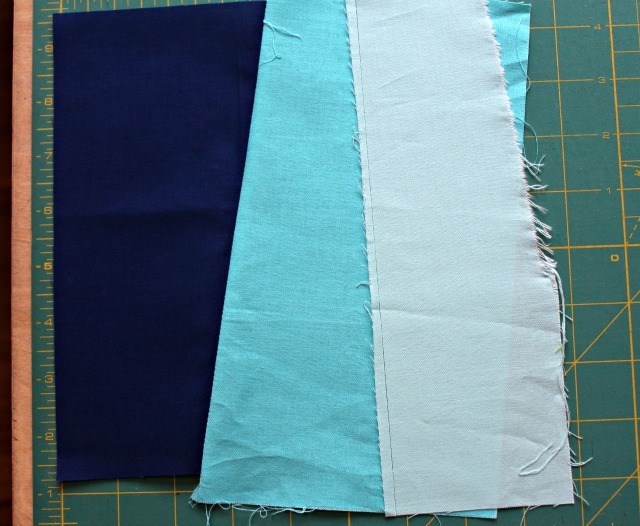 We’re going to sew from our own stashes this month, with an all-solid palette that’s similar but different than the tutorial block. 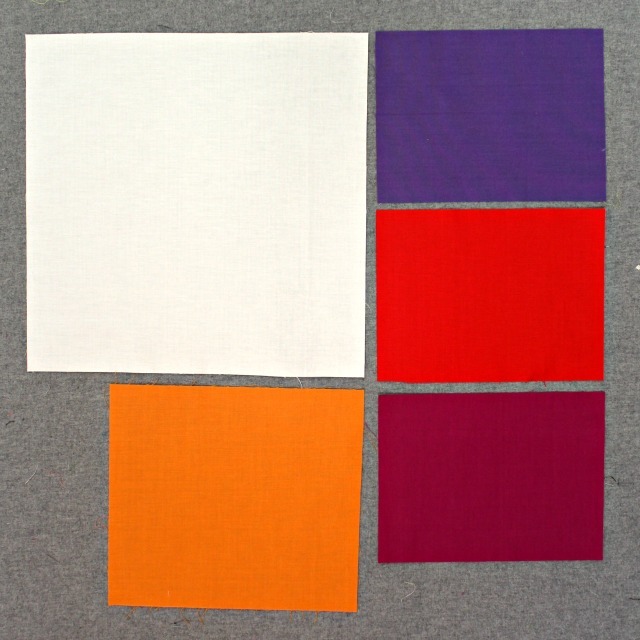 Keep the trio of oblong blocks in the same colors, magenta, medium pink, and light gray – top to bottom. 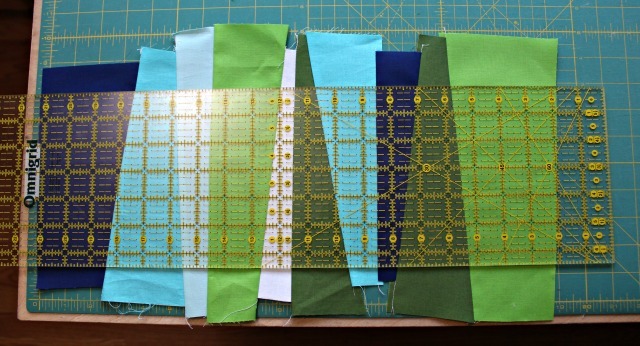 Then use a medium to dark teal for the angled strips, and for the ‘borders,’ choose a medium to dark gray. The block finishes at 12 ½” and goes together pretty quickly! If you have any questions, ask Debbie or Louise, and bring your blocks back to the November meeting! Back in June, we had a design challenge for the guild’s 2018 QuiltCon Charity Quilt. Cecelia Lehmann‘s design was chosen, though we’re going to put a bit of an improvisational spin on it. 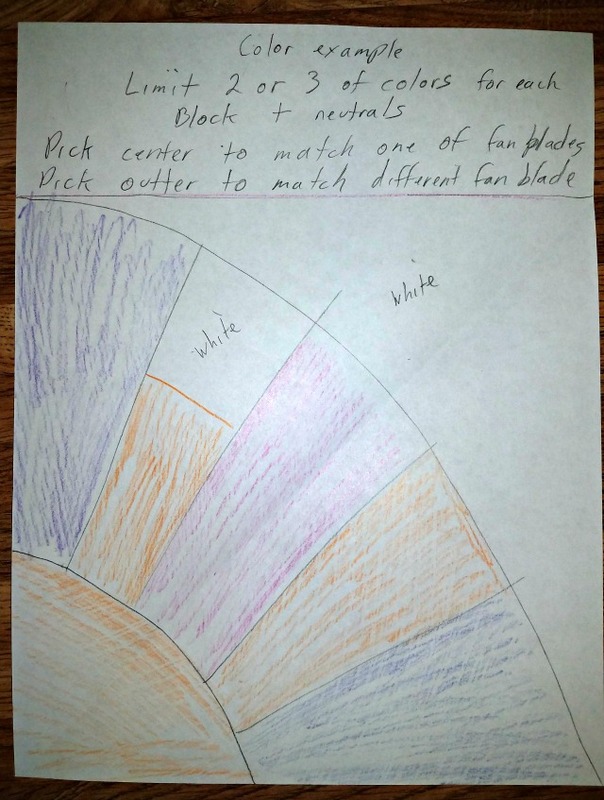 Note in the diagram below: “Pick center to match one of the fan blades. Pick outer (background) to match a different fan blade.” [We are asking for the background to be white or off-white.] 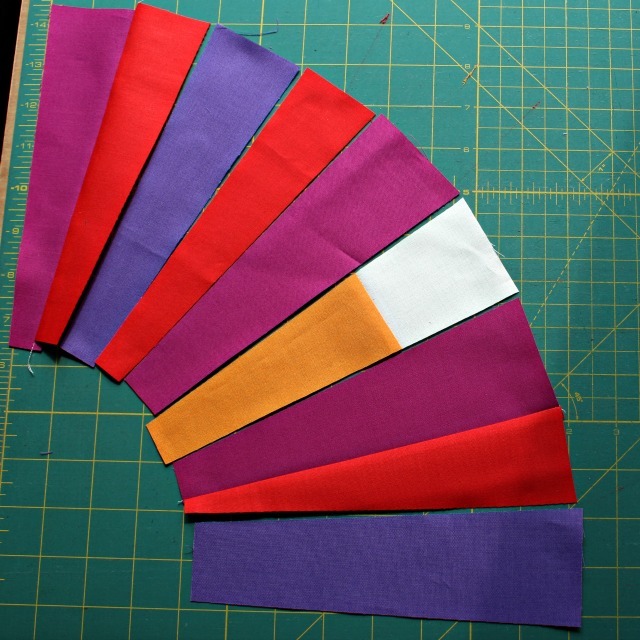 OR as shown, one of the blades can be ‘split’, consisting of both the center and background fabric. There is one other option, which will be shown in the tutorial. 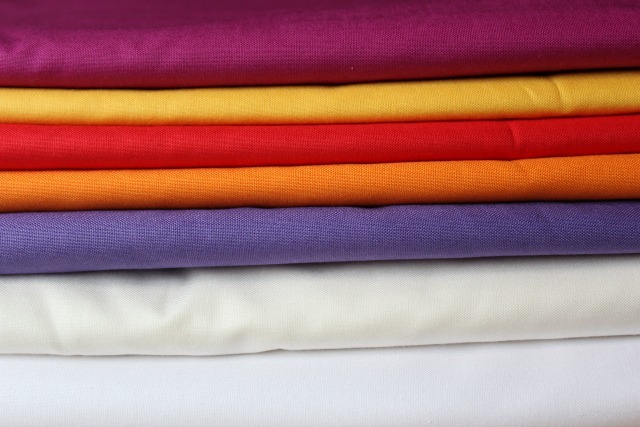 We’ll be using the color palette chosen by the Modern Quilt Guild, with fabric generously donated by Paintbrush Studio – beautiful Painter’s Palette Solids in (from bottom, below) White, Rice Paper, Purple, Tangerine, Tomato, Daisy, and Fuschia. At our meeting last week, bundles were handed out. Contact Louise or Debbie if you’d like to participate – we have just a few bundles left. PLEASE read through the block tutorial before cutting, as there are some options available. 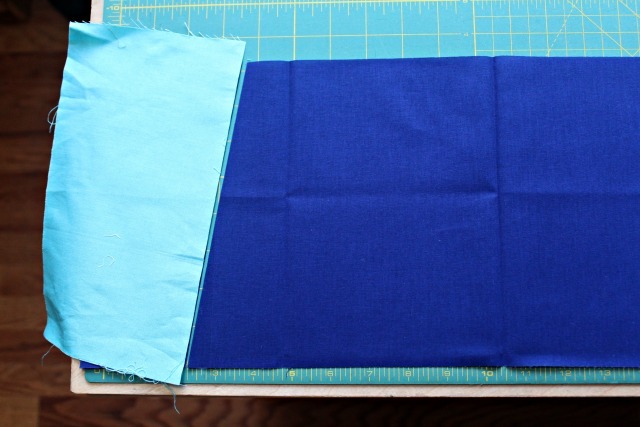 Also note that your finished block should measure 10 1/2″ square. 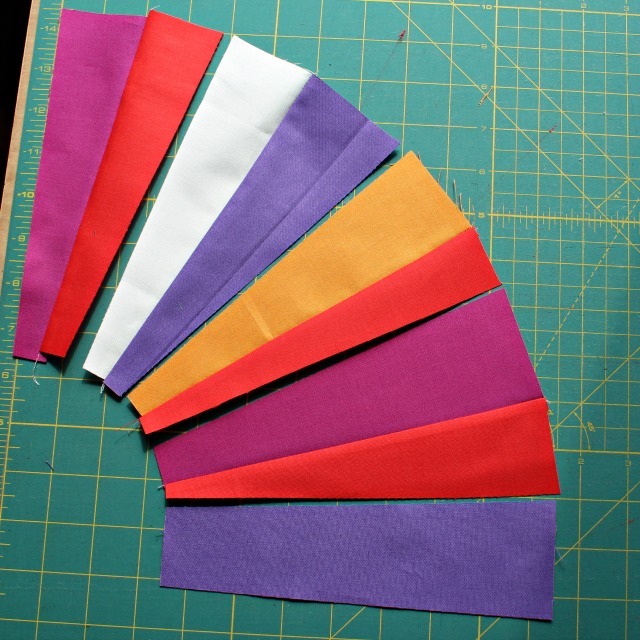 Begin by cutting into one of your 6″ x 8″ colors. Cut a couple of spoke ‘wedges’ as shown below, cutting so they are 8″ long. Repeat for your other two 6″ x 8″ pieces. 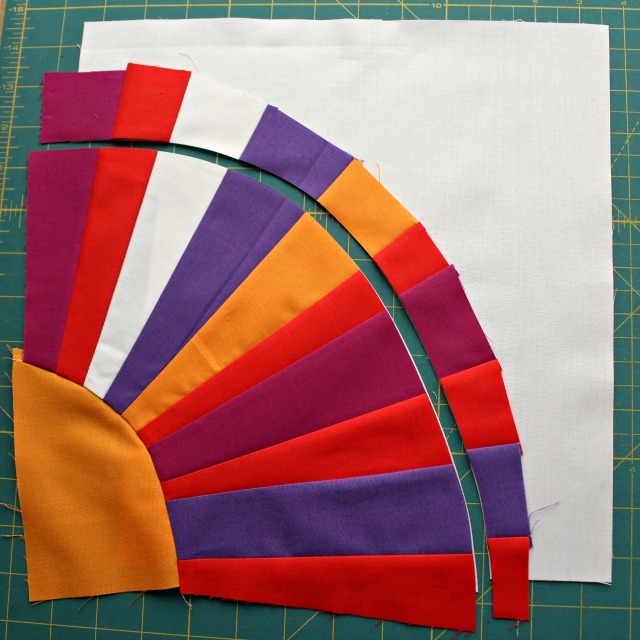 Next, cut one 8″ long wedge from the end of your block center color. Set the large piece aside for later. 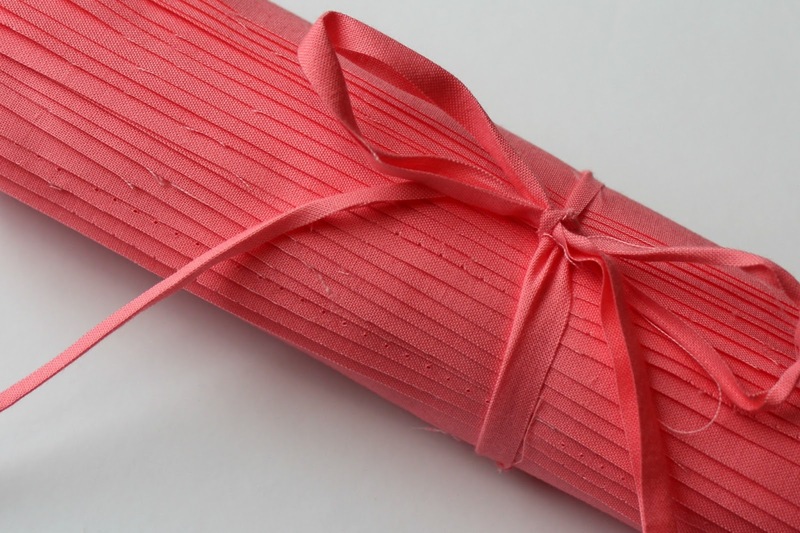 Now cut one 8″ long wedge from the corner of your background piece. Set the large piece aside for later. Begin to lay out your wedges to create a quarter circle. The side and bottom angles should be approximately at a 90-degree angle. 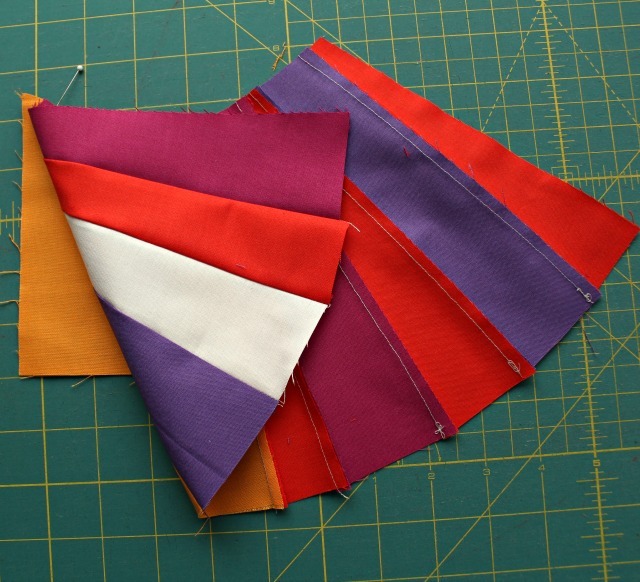 Piece your wedges together in pairs, then keep piecing until all wedges are sewn together. Remember there are a couple of options in including the background and center colors in your ‘spokes.’ You can include one of each color as shown above OR a ‘split’ spoke using both the background and center color. 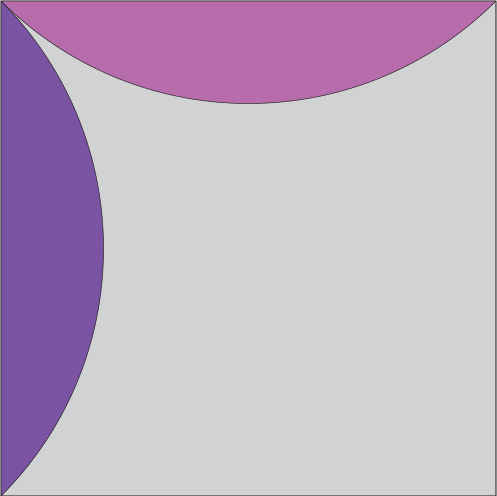 OR two split spokes – one using the background color and pointing to the background; another using the center color and pointing to the center. 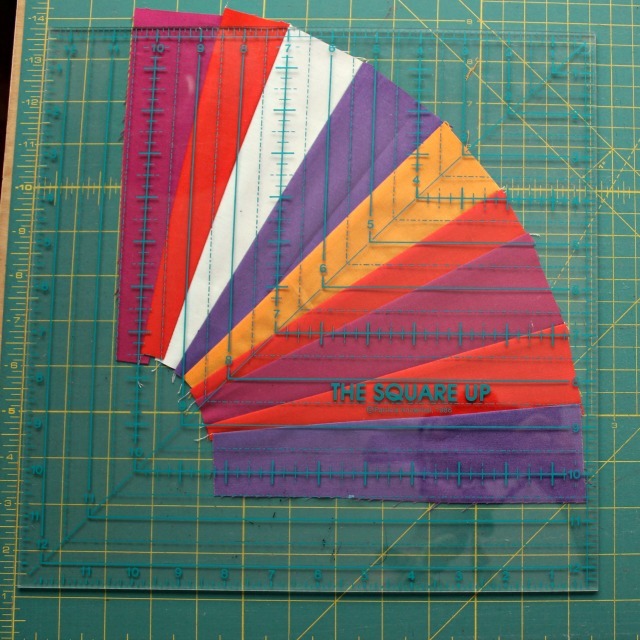 Once your wedges are all sewn together, place a clear ruler over them to make sure they are at least as large as the 10 1/2″ block size we are after. I actually added one more spoke to the bottom, to give a little wiggle-room. 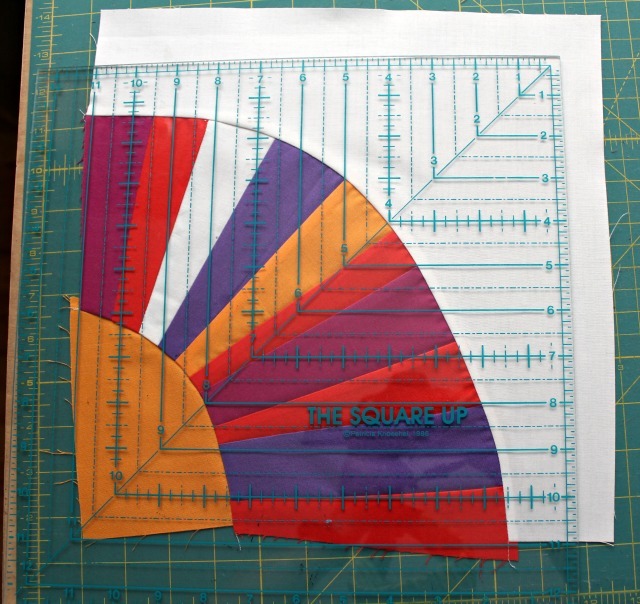 Once you determine your wedge section is large enough, slip the center piece underneath…. and cut a curve to your liking. Remove excess trimmings. 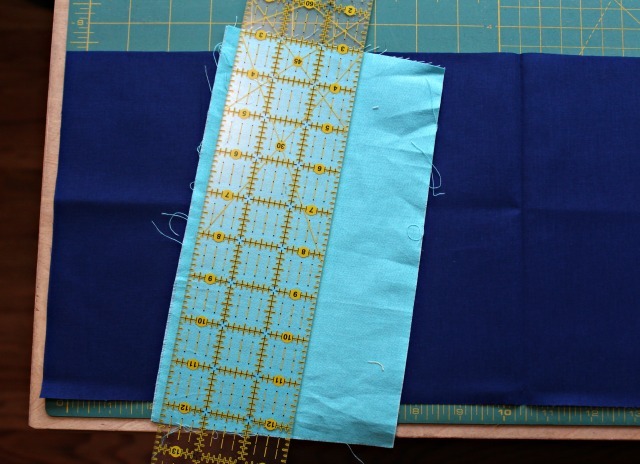 Flip your wedge piece over on top of your center piece, and start sewing from edge, easing in the curves as you sew. Sometimes it helps to stop your machine, lift the pressure foot, adjust your fabrics, then continue. It is not necessary to pin to fit the two curves together. It’s improv, and we’ll be trimming later, as needed. 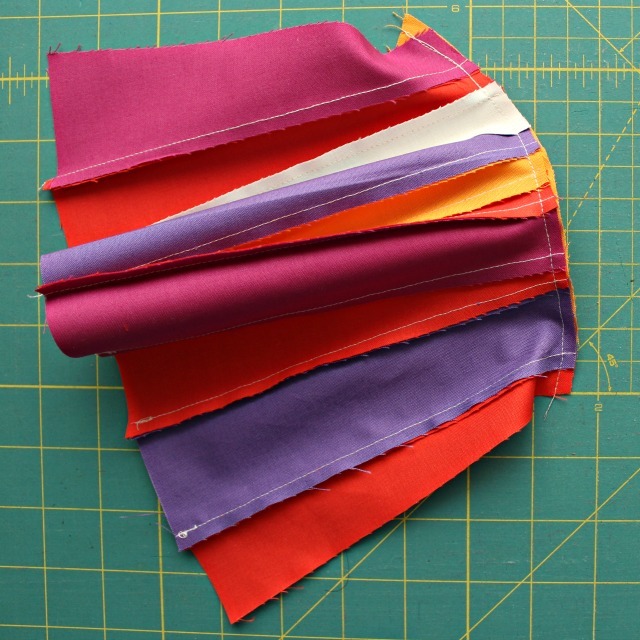 Your sewn curve will be a bit ‘full’ and that’s ok! Press seam up towards the wedges. Flip right-side up and press again. 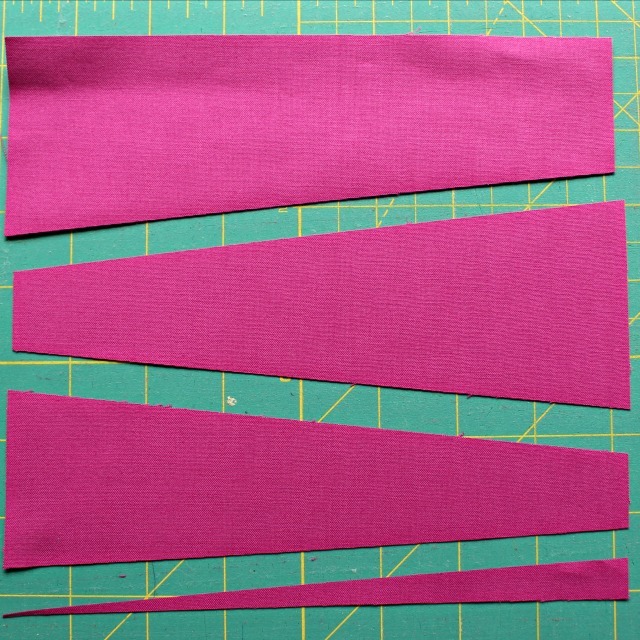 Now lay your wedge shape on top of your background fabric, with the cut-out section hidden underneath. Place your clear ruler on top of your block and consider your overall block size. 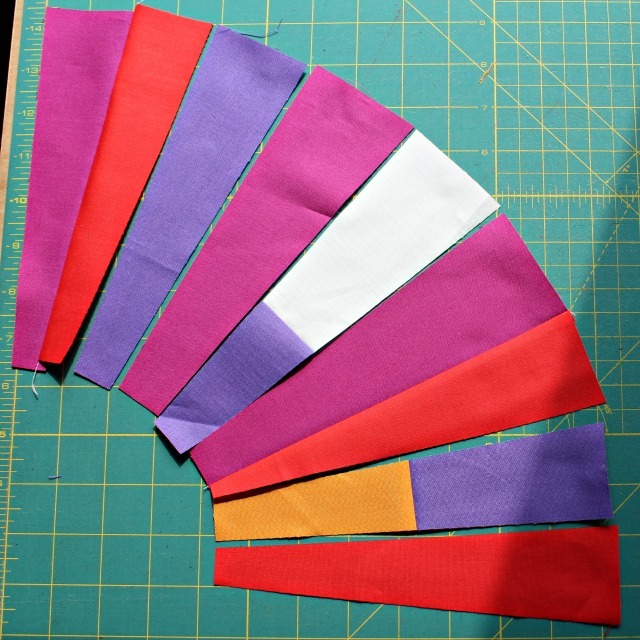 I decided I wanted more background fabric showing, so I cut my curve accordingly. Discard trimmings. Flip the background piece over onto the top of your wedges and sew the curved edges together. Again, no need to pin or match ends exactly. Press seam toward background, then turn right-side up and press again. Once again, place your clear ruler on top of your block and trim as desired to make a 10 1/2″ block. And here’s a finished block! If you have any questions, please contact Debbie or Louise. We’d like all blocks returned at the September meeting. Thank you! Ready to join in making another giving project? 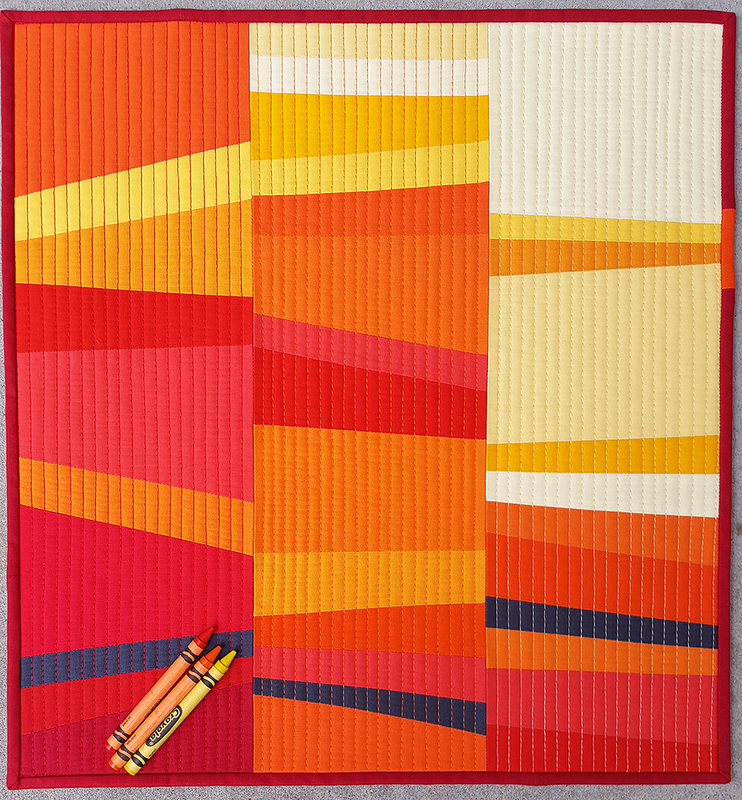 For this quilt, we’re taking our inspiration from Crayola Sunset by Anne of Play Crafts – a little bit of controlled improv using contrasting wedges of color! 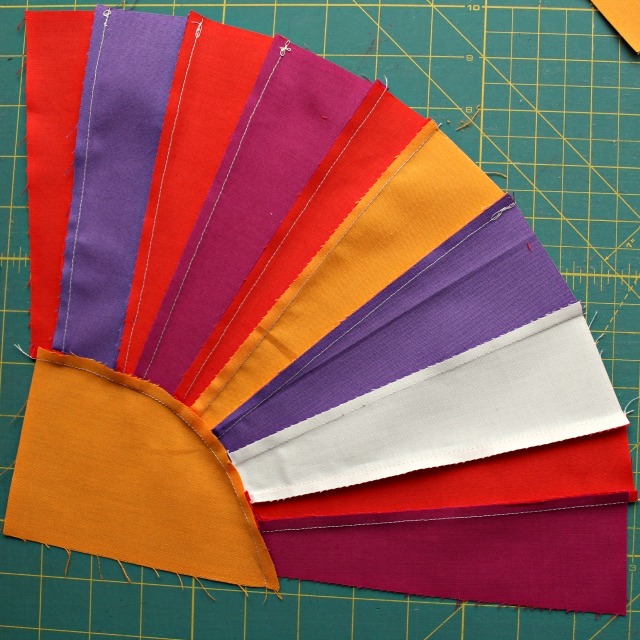 As much as we love Anne’s brilliant sunset-inspired palette, we’re going cool, as in the cool side of the color wheel. 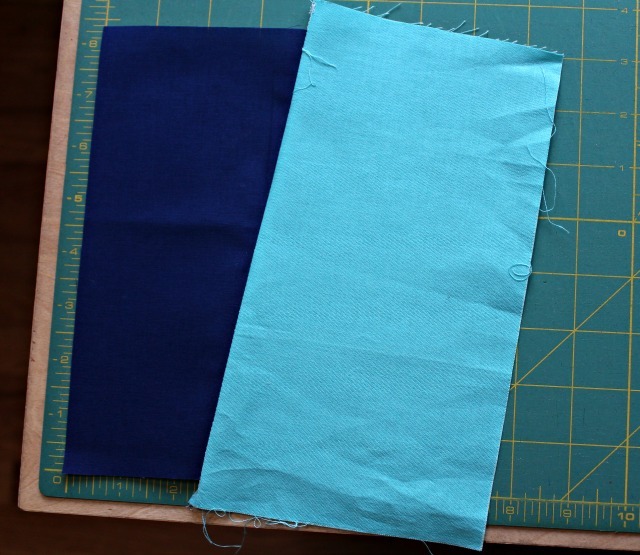 Start with two pieces of fabric approximately 8″ tall. I started with a length of navy, but it doesn’t really need to be that long. Layer one fabric on the other as shown, and cut at an angle. 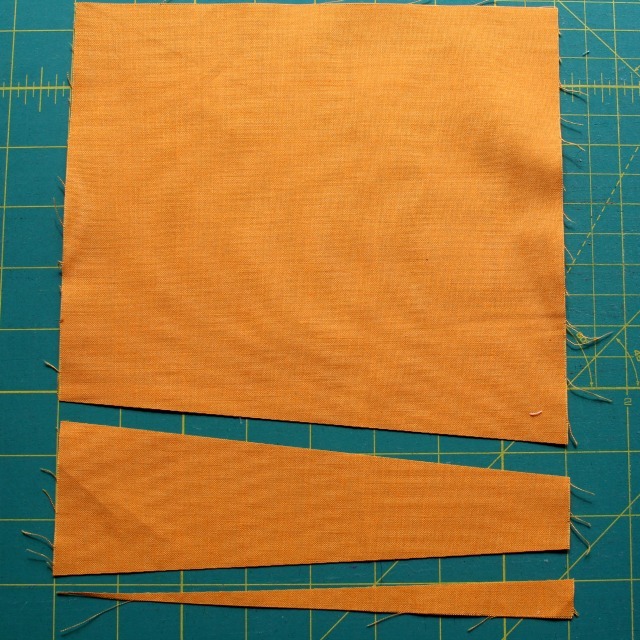 Repeat first step of layering, cutting, flipping, stitching, and pressing until you exceed your desired length by just a bit. 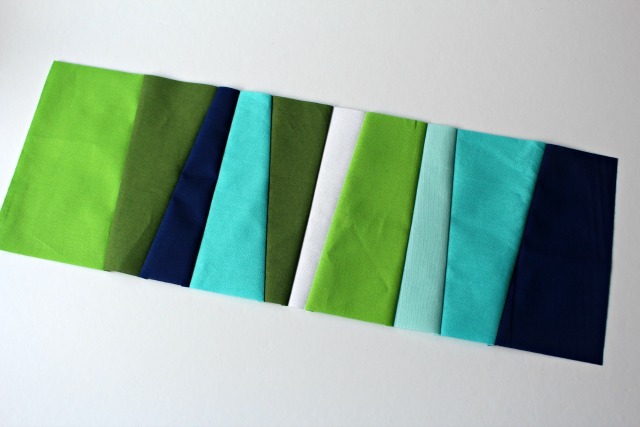 This month we’re doing a Modern Quilt Guild BOM block! Have you done any of these? I’ve been saying I want to, but never have. So I’m going to and I’m going to take you all with me on this journey! Minimalism is the concept of extreme simplicity in design. It is the idea of distilling the design down to some of the most simple forms and shapes. 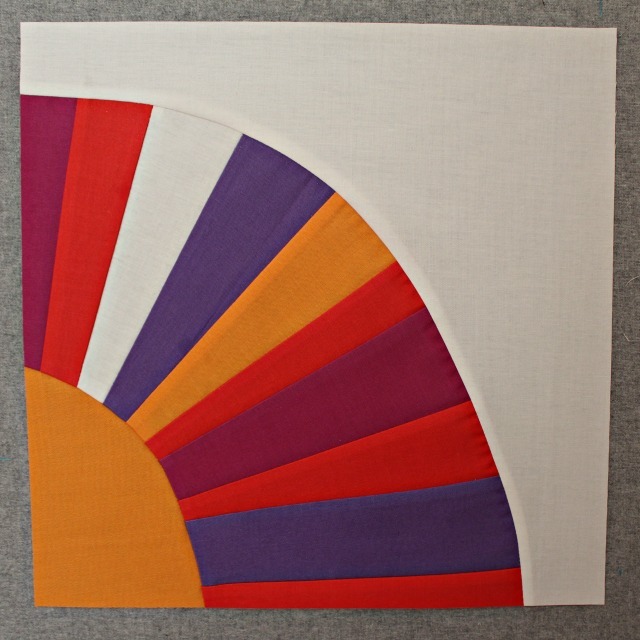 In this Block of the Month lesson, we’ll learn how to use minimalism (along with other modern quilting design fundamentals) with impact to create a modern quilt. 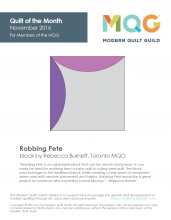 This month’s block is Robbing Pete, designed by Rebecca Burnett of the Toronto MQG, which is a variation on the traditional quilt block, Robbing Peter to Pay Paul. 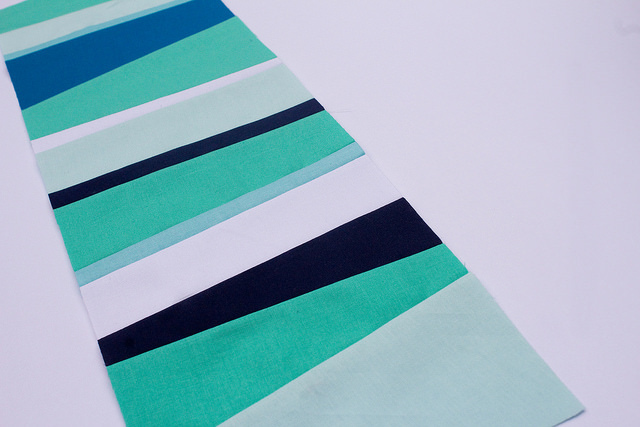 This month we’re pulling blues and greens from our own stash. For the curved pieces please use blue. And this can be any shade, print or solid. 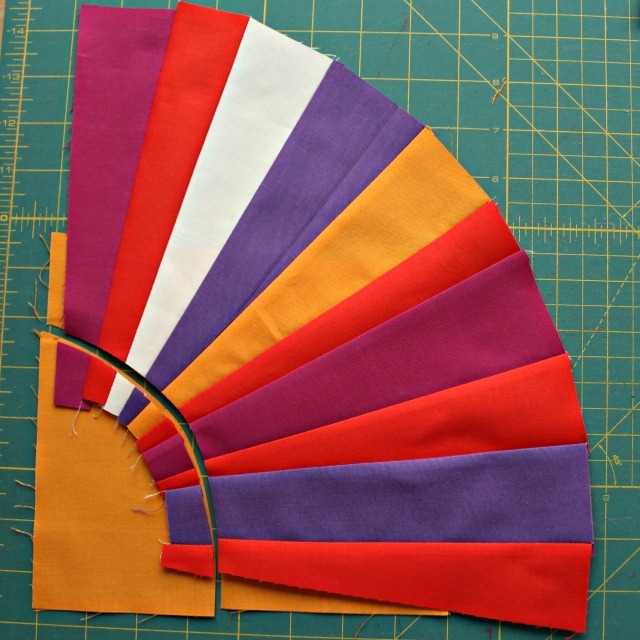 Each curved piece can be the same fabric or it can be scrappy by using two different fabrics. For the background please use a green, again, any shade, print or solid. 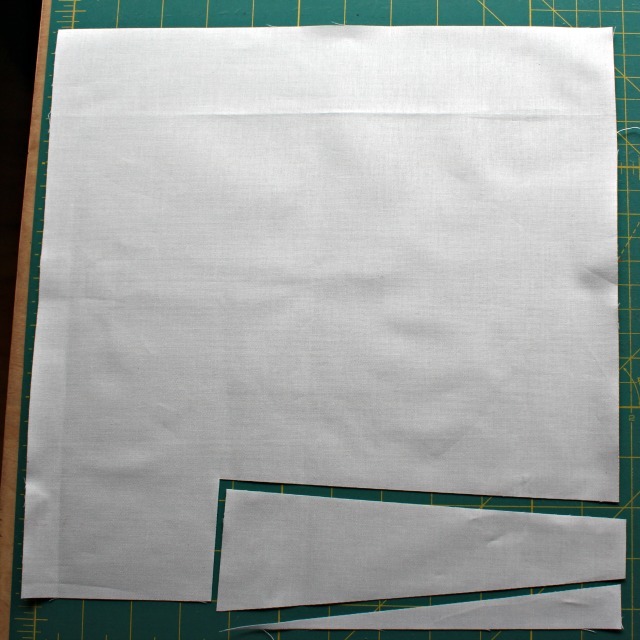 We’re going to use the 6 1/2″ block pattern on the last page of the directions. Make as many as you’d like! We can’t wait to put them together and see which pattern we end up with! Note, please don’t sew together your blocks. If you’d like some help with curves, this tutorial is very helpful! 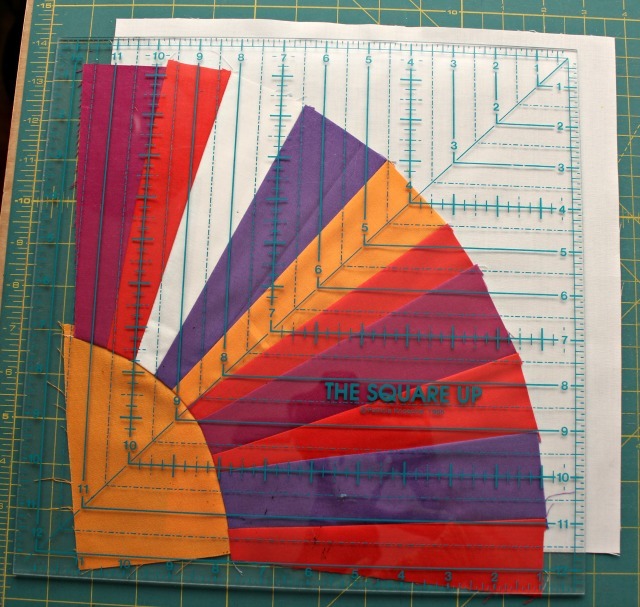 Trimming the block: If your blocks need a slight trim, Line up the diagonal on your ruler with the corner of the block. Please return your blocks to the May meeting! Have fun! Let’s get going on another giving quilt, shall we? 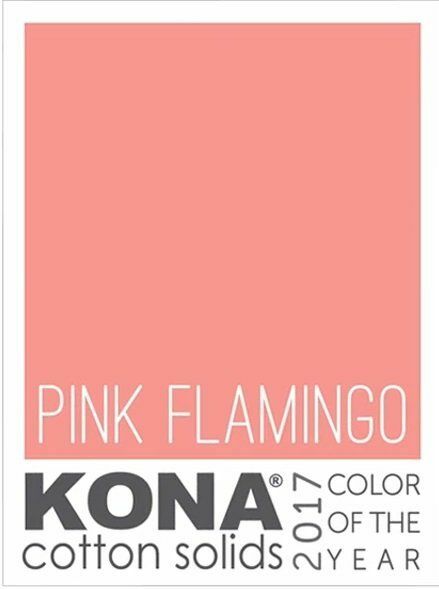 Circa15 fabric studio has kindly gifted the guild with a generous supply of Pink Flamingo, the Kona Color of the Year. We’d like you to make a 12 1/2″ improv block using the Pink Flamingo plus gray and/or white solids or prints that read as solids. All shades of gray are fine, and ‘white’ is white-white or very off-white such as Kona Snow. 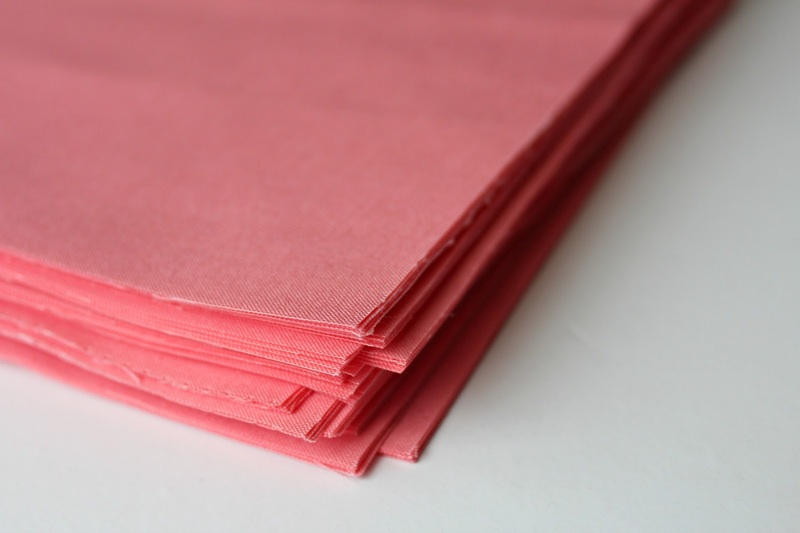 Pink Flamingo swatches measuring 9″ x 11″ will be available for pick-up at the February 8 meeting. Some white and gray solid scraps will also be available, if you need them; otherwise please feel free to pull from your stash. Please return your blocks along with any fabric you don’t use to the March meeting. As you create, we’d love to see your progress on Instagram using the hashtags #seamqggiving and #seamqg. 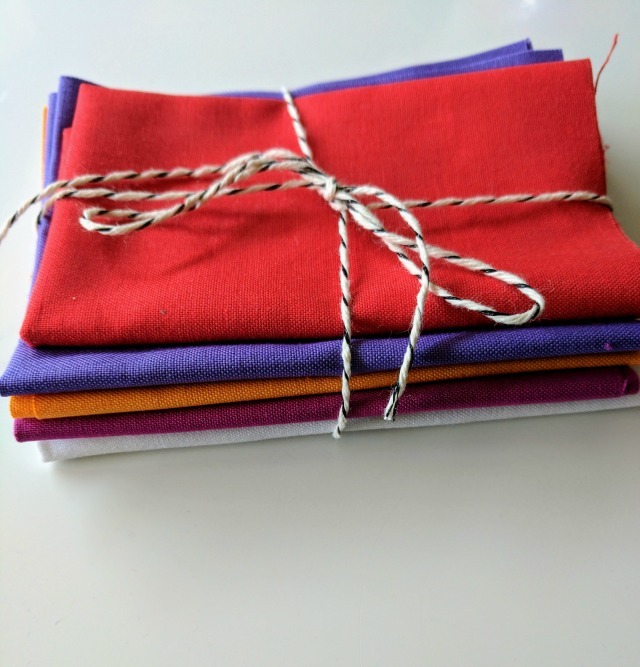 And it would be great if you thanked @circa15fabricstudio for their donation!